A week of tiresome administrative details and the weather has matched them perfectly. It has been grey, misty and cold. In the garden it felt as though nothing was changing. Buds on Sunday were exactly the same on Wednesday. Spring rushes by, it's hard to keep up and you might thing that a slow pause would be welcome. You would be wrong. The price has been coldness, wetness and a miserable shivering hiatus in activity without any significant slowing. All the things that would have happened on Monday, Tuesday and Wednesday happened together on Thursday. The sun came out like the cork on a bottle of champagne and the garden frothed insanely. 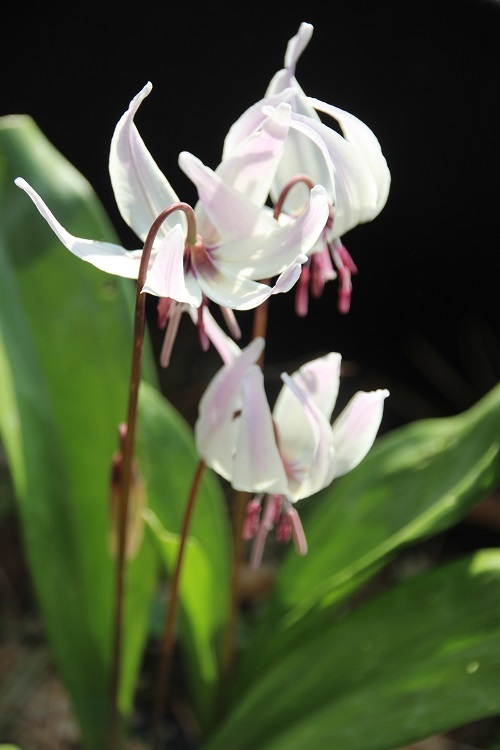 Last week the Erythronium were clusters of thoroughly practical buds among the lush leaves, little alien pods of promise. In the sunshine the first of them have opened and the grumpy garden has cheered. Erythronium hendersonii comes from the mountains of northern California and southern Oregon so I am astonished to see it adapt so well to the misty week. As soon as the sun came out the buds burst and although my plant is still small, it is twice the size it was last year. I have been hoping that a change in the weather would see a change in the tone of the week. I took a picture that resembles this one on Wednesday. It was the same plant, pictured from the same position, the greyness of the week swirling through the branches. Later that evening my computer crashed and it looks as though it is unrecoverable. With it went all of the pictures. I was forced to go out and do them all again which has been a good thing, the sun has shone, the pictures are better, the misery of the week has lifted, the computer is still dead. I will find out next week what can be salvaged. I had time for a quick cup of stress-avoidance coffee, allowed the shock to subside for a day and went to the Alpine Garden Society show at Rosemoor. Arriving home with a tray of new plants I went to my trusty labelling machine and it has decided to talk gibberish. It still prints, but there is no telling what it will say. I am perplexed and as ever, blaming the pixies (although this looks more like demonic posession). It has been a wet week of malevolent machinery. The sunshine should do some good. With that cheering prospect in view I sat down to write this piece and promptly erased half of the template. The "stupidity" backup copy, inevitably, on the broken computer. In a couple of hours the week will end, we will start a new one and I can put it all behind me. Peace, calm, soothing coffee and (unfortunately) Mars Bars to help me through the trauma. Who could have imagined, when pc's arrived on the scene, the horrifying price they would exact in return for the magic. Hey-ho. 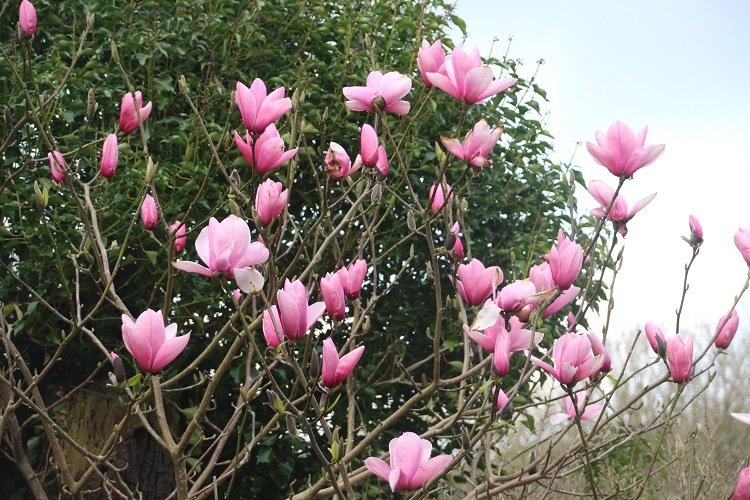 Magnolia 'Star Wars'. Somehow it feels like a warning. 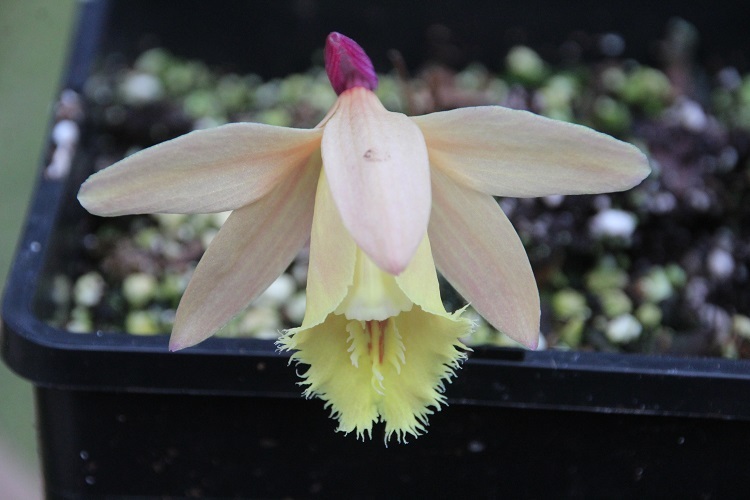 In the meantime the Pleione live in the greenhouse, thin plastic coccoon of meterological magic that it is. It is warm in there. It's dry as well as long as I don't stand under the drip (and I don't stand under the drip). I have seen a number of cultivars in flower at shows and events over the last fortnight. Inevitably someone will sidle up to me and tell me they are hardy outside you know! Yes, I know and they hate it. Bring in a pan of Pleione you have grown outside and then come and tell me about it you ... calm, soothing. Perhaps just one more Mars Bar. P. Quizapu 'Peregrine' is my black sheep of the genus. Or orange sheep or something. Not really a sheep at all I suppose. Whatever it is, it thoroughly is and I am filled with hope and anxiety. I first saw the cultivar on a televised piece from one of the shows, a pale orange beauty nestled among the pinks. It took me a while to identify it and a little longer to obtain one. Flowered wonderfully, dropped dead. My own fault I am sure, still feeling for a reliable cultivation technique at the time. I must try to remember the insecurity of failure the next time someone tries to tell me you can only grow Pleione in unicorn poo or some other unlikely nonsense. People are finding a way through failure, just like me. (Are you mad you bat-eared oil-slick of idiocy polluting he ocean of your own ignorance). Probably best not to say that on reflection. I have killed 'Peregrine' and I was frightened of having another go. I bit the bullet, I have a flower and I am sufficiently patient to leave the rest to the fates. Either I will have a new growth in the summer or I won't. Really quite calm about it, can't you tell? Orchids are, as anyone who has seen them growing wild can tell you, stunningly easy. The only problem in cultivation lies in controlling the climate. 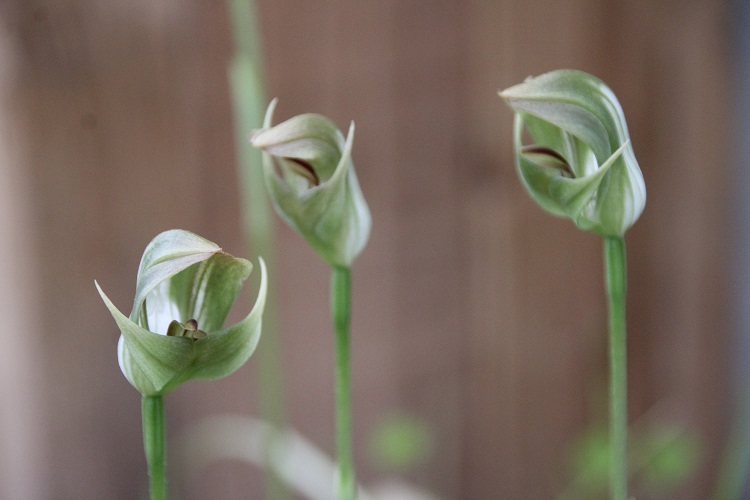 Creating a little bit of Australian weather here in Cornwall has presented some challenges over the years and that is what is needed to grow Pterostylis curta. I have had it for a long time and for decades it has teetered on the brink of oblivion as I struggle to make sense of the obvious. I will explain the essentials. It is a tuberous species that grows in winter, flowers and then dies down until autumn. It comes up again, grows through winter and flowers in spring. It's really quite simple. Water it when it is growing, stop when it is dormant. It comes from south-eastern Australia so it will take a light frost but no more. Really quite simple. Somehow it took me forty years to work out. Bat-eared oil-slick of idiocy polluting my own ocean of ignorance. I like that phrase. Sums things up nicely. So the week comes to an end, the computer doesn't work, I am rapidly forgetting what the plants are that I bought yesterday and I have eaten more Mars Bars this week than I did during all of the last year. Spring, with its spectrum of possibilities has arrived like a drunk aunt at a birthday party. The distinction between humour and horror is terrifyingly fine.